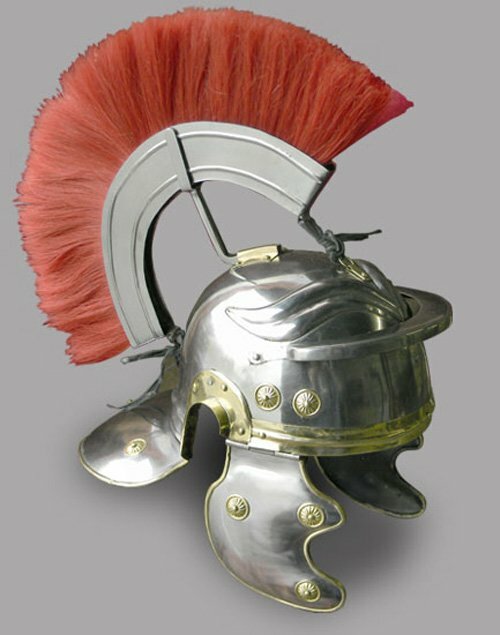 Helmets were like hair styles to the romans. The design of their helmets changed so much that it’s difficult to track exactly what helmet was worn at what place and what time. We do know that there were two basic styles of later Roman helmets. The finely crafted Gallic helmets, and the “cheap-Chinese knock-off” Italic helms. (In all fairness, the Italic helms started off as inferior, but, in the later years, these helmets, became as good as the Gallic, or better). This helmet is a fine example of an Imperial Gallic, type H or type D helmet. These helmets were easy to spot by the decorative, swirly, eyebrows embossed onto the front. Also of note on these helmets were the brass “coral” bosses (two on each temple, three on the cheek pieces and three on the neck guard)(Yes, that’s right, these helmets have more bosses than I do—quite a feat). A pivoted brow band can be swung down over the forehead for extra protection, or straight up over the crown. The crowning glory of this helmet (literally) is the red, horse-hair crest, mounted lengthwise, with tie rings on the front and back for leather cords for security. 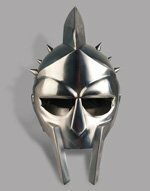 The helmet is made from 18-gauge steel. It comes with a leather liner inside and leather straps. The helmet ships with the crest unattached. Follow this link for simple instructions on attaching the crest! 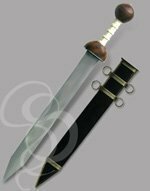 Material: 16-Gauge High Carbon Steel with Brass Accents and Trim. Leather Liner included.